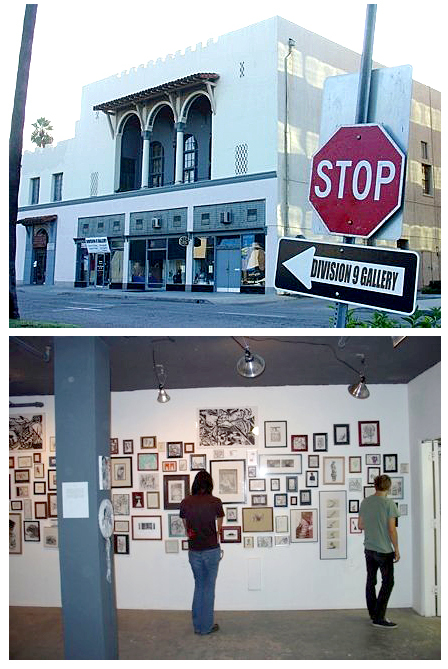 Downtown Riverside art gallery, Division 9, is offering two great art events in the next few days. On Thursday night, D9’s Cosme Cordova will be opening 50 @ the 9. If you have someone on your gift list that would appreciate a terrific piece of original art, this is the place to go. 14 local artists have produced 10 works apiece — on wooden panel in a variety of mediums — all at unbelievably low prices. I’ve purchased pieces from similar shows and love every one … definitely worth the trip to support local artists and this Riverside alt.art spot. Click here for more info. Also: On Sunday, D9’s hosting a Thrifty Giving Workshops & Musick event. For that truly personal touch you can make your gift here at one of three workshops: monoprinting ($5), candle making (free!) and make-your-own-‘zine (free!). There will also be live music from 8 to 10pm by Norse Horse, Stay Cool Forever and No Paws. Click here for more. Like all small arts concerns, Division 9 Gallery could use the support of local arts lovers during these difficult times … see you there Thursday!